^ The range of angular size values given are based on simple scaling of the following values given in the fact sheet reference: at an Earth-equator to Moon-centre distance of 378 000 km, the angular size is 1896 arcseconds. The same fact sheet gives extreme Earth-Moon distances of 407 000 km and 357 000 km. For the maximum angular size, the minimum distance has to be corrected for the Earth's equatorial radius of 6 378 km, giving 350 600 km. ^ Lucey et al. (2006) give 107 particles cm−3 by day and 105 particles cm−3 by night. Along with equatorial surface temperatures of 390 K by day and 100 K by night, the ideal gas law yields the pressures given in the infobox (rounded to the nearest order of magnitude; 10−7 帕 by day and 10−10Pa by night. ^ 更精確的說，月球的平會合週期（與太陽合的平均值）是29.530589天(29d 12h 44m 02.9s) (天文曆書的補充解釋, 1961, at p.107). ^ 1.0 1.1 1.2 1.3 1.4 Williams, Dr. David R. Moon Fact Sheet. 美国国家航空航天局. 2006-02-02 [2008-12-31]. ^ Matthews, Grant. Celestial body irradiance determination from an underfilled satellite radiometer: application to albedo and thermal emission measurements of the Moon using CERES. Applied Optics. 2008, 47 (27): 4981–93. Bibcode:2008ApOpt..47.4981M. PMID 18806861. doi:10.1364/AO.47.004981. ^ A.R. Vasavada, D.A. Paige, and S.E. Wood. Near-Surface Temperatures on Mercury and the Moon and the Stability of Polar Ice Deposits. Icarus. 1999, 141: 179. Bibcode:1999Icar..141..179V. doi:10.1006/icar.1999.6175. ^ 新京报. “嫦娥四号”将于12月8日凌晨在西昌发射升空. 新浪新闻. 2018-12-07 [2018-12-07]. ^ Naming Astronomical Objects: Spelling of Names. International Astronomical Union. [2010-03-29]. ^ Gazetteer of Planetary Nomenclature: Planetary Nomenclature FAQ. USGS Astrogeology Research Program. [2010-03-29]. ^ Barnhart, Robert K. The Barnhart Concise Dictionary of Etymology. USA: Harper Collins. 1995: 487. ISBN 0-06-270084-7. ^ Imke Pannen. When the Bad Bleeds: Mantic Elements in English Renaissance Revenge Tragedy. V&R unipress GmbH. 2010: 96–. ISBN 978-3-89971-640-5. ^ Binder, A.B. On the origin of the Moon by rotational fission. The Moon. 1974, 11 (2): 53–76. 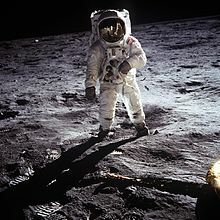 Bibcode:1974Moon...11...53B. doi:10.1007/BF01877794. ^ 16.0 16.1 16.2 Stroud, Rick. The Book of the Moon. Walken and Company. 2009: 24–27. ISBN 0802717349. ^ Mitler, H.E. Formation of an iron-poor moon by partial capture, or: Yet another exotic theory of lunar origin. Icarus. 1975, 24: 256–268. Bibcode:1975Icar...24..256M. doi:10.1016/0019-1035(75)90102-5. ^ Stevenson, D.J. Origin of the moon–The collision hypothesis. Annual Review of Earth and Planetary Sciences. 1987, 15: 271–315. Bibcode:1987AREPS..15..271S. doi:10.1146/annurev.ea.15.050187.001415. ^ Taylor, G. Jeffrey. Origin of the Earth and Moon. Planetary Science Research Discoveries. 1998-12-31 [2010-04-07]. ^ Dana Mackenzie. The Big Splat, or How Our Moon Came to Be. John Wiley & Sons. 2003-07-21: 166–168. ISBN 978-0-471-48073-0. ^ Nield, Ted. Moonwalk (summary of meeting at Meteoritical Society's 72nd Annual Meeting, Nancy, France). Geoscientist. 2009, 19: 8. （原始内容存档于2012-09-27）. ^ 24.0 24.1 Warren, P. H. The magma ocean concept and lunar evolution. Annual review of earth and planetary sciences. 1985, 13: 201–240. Bibcode:1985AREPS..13..201W. doi:10.1146/annurev.ea.13.050185.001221. ^ Daniel Clery. Impact Theory Gets Whacked. Science. 2013-10-11, 342 (6155): 183–185. Bibcode:2013Sci...342..183C. doi:10.1126/science.342.6155.183. ^ 新研究称地球可能曾有两个月亮. 科学网. 2011-08-04 [2011-08-04]. ^ Wiechert, U.; 等. Oxygen Isotopes and the Moon-Forming Giant Impact. Science (Science (journal)). October 2001, 294 (12): 345–348 [2009-07-05]. Bibcode:2001Sci...294..345W. PMID 11598294. doi:10.1126/science.1063037. ^ Pahlevan, Kaveh; Stevenson, David. Equilibration in the Aftermath of the Lunar-forming Giant Impact. EPSL. October 2007, 262 (3–4): 438–449. Bibcode:2007E&PSL.262..438P. arXiv:1012.5323. doi:10.1016/j.epsl.2007.07.055. ^ Taylor, Stuart Ross. Lunar science: A post-Apollo view. New York, Pergamon Press, Inc. 1975: 64. ^ NASA - NASA Research Team Reveals Moon Has Earth-Like Core. nasa.gov. ^ Nemchin, A.; Timms, N.; Pidgeon, R.; Geisler, T.; Reddy, S.; Meyer, C. Timing of crystallization of the lunar magma ocean constrained by the oldest zircon. Nature Geoscience. 2009, 2: 133–136. Bibcode:2009NatGe...2..133N. doi:10.1038/ngeo417. ^ Landscapes from the ancient and eroded lunar far side. esa. [2010-02-15]. ^ Alexander, M. E. The Weak Friction Approximation and Tidal Evolution in Close Binary Systems. Astrophysics and Space Science. 1973, 23: 459–508 [2010-03-20]. Bibcode:1973Ap&SS..23..459A. doi:10.1007/BF00645172. ^ Phil Plait. Dark Side of the Moon. Bad Astronomy:Misconceptions. [2010-02-15]. ^ Pieters, C.M. ; Tompkins, S.; Head, J.W. ; Hess, P.C. Mineralogy of the Mafic Anomaly in the South Pole‐Aitken Basin: Implications for excavation of the lunar mantle. Geophysical Research Letters. 1997, 24 (15): 1903–1906. Bibcode:1997GeoRL..24.1903P. doi:10.1029/97GL01718. （原始内容存档于2011-02-19）. ^ Taylor, G.J. The Biggest Hole in the Solar System. Planetary Science Research Discoveries, Hawai'i Institute of Geophysics and Planetology. 1998-07-17 [2007-04-12]. ^ Wlasuk, Peter. Observing the Moon. Springer. 2000: 19. ISBN 1852331933. ^ Norman, M. The Oldest Moon Rocks. Planetary Science Research Discoveries. 2004-04-21 [2007-04-12]. ^ Varricchio, L. Inconstant Moon. Xlibris Books. 2006. ISBN 1-59926-393-9. ^ Head, L.W.J.W. Lunar Gruithuisen and Mairan domes: Rheology and mode of emplacement. Journal of Geophysical Research. 2003, 108: 5012 [2007-04-12]. Bibcode:2003JGRE..108.5012W. doi:10.1029/2002JE001909. （原始内容存档于2007-03-12）. ^ 50.0 50.1 50.2 50.3 50.4 50.5 50.6 50.7 Spudis, P.D. Moon. World Book Online Reference Center, NASA. 2004 [2007-04-12]. （原始内容存档于2013-07-03）. ^ Taylor, G.J. A New Moon for the Twenty-First Century. Planetary Science Research Discoveries, Hawai'i Institute of Geophysics and Planetology. 2000-08-31 [2007-04-12]. ^ Munsell, K. Majestic Mountains. Solar System Exploration. NASA. 2006-12-04 [2007-04-12]. （原始内容存档于2008-09-17）. ^ Melosh, H. J. Impact cratering: A geologic process. Oxford Univ. Press. 1989. ISBN 0195042840. ^ Moon Facts. SMART-1. European Space Agency. 2010 [2010-05-12]. ^ Gazetteer of Planetary Nomenclature: Categories for Naming Features on Planets and Satellites. U.S. Geological Survey. [2010-04-08]. ^ Hartmann, William K.; Quantin, Cathy; Mangold, Nicolas. Possible long-term decline in impact rates: 2. Lunar impact-melt data regarding impact history. Icarus. 2007, 186: 11–23. Bibcode:2007Icar..186...11H. doi:10.1016/j.icarus.2006.09.009. ^ The Smell of Moondust. NASA. 2006-01-30 [2010-03-15]. （原始内容存档于2010-03-08）. ^ Margot, J. L.; Campbell, D. B.; Jurgens, R. F.; Slade, M. A. Topography of the Lunar Poles from Radar Interferometry: A Survey of Cold Trap Locations. Science. 1999-06-04, 284 (5420): 1658–1660. Bibcode:1999Sci...284.1658M. PMID 10356393. doi:10.1126/science.284.5420.1658. ^ Ward, William R. Past Orientation of the Lunar Spin Axis. Science. 1975-08-01, 189 (4200): 377–379. Bibcode:1975Sci...189..377W. PMID 17840827. doi:10.1126/science.189.4200.377. ^ 67.0 67.1 Martel, L.M.V. The Moon's Dark, Icy Poles. Planetary Science Research Discoveries, Hawai'i Institute of Geophysics and Planetology. 2003-06-04 [2007-04-12]. ^ Seedhouse, Erik. 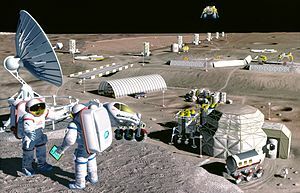 Lunar Outpost: The Challenges of Establishing a Human Settlement on the Moon. Springer-Praxis Books in Space Exploration. Germany: Springer Praxis. 2009: 136. ISBN 0387097465. ^ Coulter, Dauna. The Multiplying Mystery of Moonwater. Science@NASA. 2010-03-18 [2010-03-28]. （原始内容存档于2016-05-16）. ^ Spudis, P. Ice on the Moon. The Space Review. 2006-11-06 [2007-04-12]. ^ Lakdawalla, Emily. LCROSS Lunar Impactor Mission: "Yes, We Found Water!". The Planetary Society. 2009-11-13 [2010-04-13]. （原始内容存档于2010-01-22）. ^ Colaprete, A.; Schultz, P.; Heldmann, J.; Wooden, D.; Shirley, M.; Ennico, K.; Hermalyn, B.; Marshall, W; Ricco, A.; Elphic, R. C.; Goldstein, D.; Summy, D.; Bart, G. D.; Asphaug, E.; Korycansky, D.; Landis, D.; Sollitt, L. Detection of Water in the LCROSS Ejecta Plume. Science. 2010-10-22, 330 (6003): 463–468. Bibcode:2010Sci...330..463C. PMID 20966242. doi:10.1126/science.1186986. ^ Garrick-Bethell, Ian; Weiss, iBenjamin P.; Shuster, David L.; Buz, Jennifer. Early Lunar Magnetism. Science. 2009, 323 (5912): 356–359. Bibcode:2009Sci...323..356G. PMID 19150839. doi:10.1126/science.1166804. ^ Magnetometer / Electron Reflectometer Results. Lunar Prospector (NASA). 2001 [2010-03-17]. （原始内容存档于2010-05-27）. ^ Globus, Ruth. 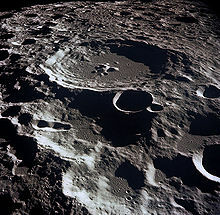 Chapter 5, Appendix J: Impact Upon Lunar Atmosphere. (编) Richard D. Johnson & Charles Holbrow. Space Settlements: A Design Study. NASA. 1977 [2010-03-17]. ^ Crotts, Arlin P.S. Lunar Outgassing, Transient Phenomena and The Return to The Moon, I: Existing Data. (PDF). Department of Astronomy, Columbia University. 2008 [2009-09-29]. ^ 84.0 84.1 84.2 Stern, S.A. 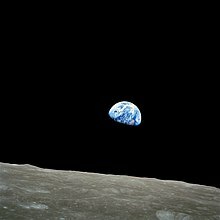 The Lunar atmosphere: History, status, current problems, and context. Rev. Geophys. 1999, 37: 453–491. Bibcode:1999RvGeo..37..453S. doi:10.1029/1999RG900005. ^ 87.0 87.1 Jonathan Amos. 'Coldest place' found on the Moon. BBC News. 2009-12-16 [2010-03-20]. ^ Diviner News. UCLA. 2009-09-17 [2010-03-17]. （原始内容存档于2010-03-07）. ^ V V Belet︠s︡kiĭ. Essays on the Motion of Celestial Bodies. Birkhäuser. 2001: 183. ISBN 3764358661. ^ Space Topics: Pluto and Charon. The Planetary Society. [2010-04-06]. ^ Planet Definition Questions & Answers Sheet. International Astronomical Union. 2006 [2010-03-24]. （原始内容存档于2012-03-15）. ^ Luciuk, Mike. How Bright is the Moon?. Amateur Astronomers, Inc. [2010-03-16]. ^ Hershenson, Maurice. The Moon illusion. Routledge. 1989: 5. ISBN 9780805801217. ^ Spekkens, K. Is the Moon seen as a crescent (and not a "boat") all over the world?. Curious About Astronomy. 2002-10-18 [2010-03-16]. （原始内容存档于2010-06-30）. ^ Taylor, G.J. Recent Gas Escape from the Moon. Planetary Science Research Discoveries, Hawai'i Institute of Geophysics and Planetology. 2006-11-08 [2007-04-04]. ^ 22 Degree Halo: a ring of light 22 degrees from the sun or moon. Department of Atmospheric Sciences at the University of Illinois at Urbana-Champaign. [2010-04-13]. ^ 99.0 99.1 99.2 99.3 99.4 Lambeck, K. Tidal Dissipation in the Oceans: Astronomical, Geophysical and Oceanographic Consequences. Philosophical Transactions for the Royal Society of London. Series A, Mathematical and Physical Sciences. 1977, 287 (1347): 545–594. Bibcode:1977RSPTA.287..545L. doi:10.1098/rsta.1977.0159. ^ Ray, R. Ocean Tides and the Earth's Rotation. IERS Special Bureau for Tides. 2001-05-15 [2010-03-17]. ^ Murray, C.D. and Dermott, S.F. Solar System Dynamics. Cambridge University Press. 1999: 184. ISBN 0521572959. ^ Dickinson, Terence. From the Big Bang to Planet X. Camden East, Ontario: Camden House. 1993: 79–81. ISBN 0-921820-71-2. ^ Phillips, Tony. Stereo Eclipse. Science@NASA. 2007-03-12 [2010-03-17]. （原始内容存档于2008-06-10）. ^ Espenak, F. Saros Cycle. NASA. [2010-03-17]. ^ Guthrie, D.V. The Square Degree as a Unit of Celestial Area. Popular Astronomy. 1947, 55: 200–203. Bibcode:1947PA.....55..200G. ^ Total Lunar Occultations. Royal Astronomical Society of New Zealand. [2010-03-17]. ^ Aaboe, A.; Britton, J. P.; Henderson,, J. A.; Neugebauer, Otto; Sachs, A. J. Saros Cycle Dates and Related Babylonian Astronomical Texts. Transactions of the American Philosophical Society (American Philosophical Society). 1991, 81 (6): 1–75 [2010-04-08]. doi:10.2307/1006543. One comprises what we have called "Saros Cycle Texts," which give the months of eclipse possibilities arranged in consistent cycles of 223 months (or 18 years). ^ Sarma, K. V. Astronomy in India. (编) Helaine Selin. Encyclopaedia of the History of Science, Technology, and Medicine in Non-Western Cultures 2. Springer. 2008: 317–321. ISBN 9781402045592. ^ Robertson, E. F. Aryabhata the Elder. Scotland: School of Mathematics and Statistics, University of St Andrews. November 2000 [2010-04-15]. ^ A. I. Sabra. Ibn Al-Haytham, Abū ʿAlī Al-Ḥasan Ibn Al-Ḥasan. Dictionary of Scientific Biography. Detroit: Charles Scribner's Sons. 2008: 189–210, at 195. ^ Lewis, C. S. The Discarded Image. Cambridge: Cambridge University Press. 1964: 108. ISBN 0-52147735-2. ^ van der Waerden, Bartel Leendert. The Heliocentric System in Greek, Persian and Hindu Astronomy. Annals of the New York Academy of Sciences. 1987, 500: 1–569. Bibcode:1987NYASA.500....1A. PMID 3296915. doi:10.1111/j.1749-6632.1987.tb37193.x. ^ Evans, James. The History and Practice of Ancient Astronomy. Oxford & New York: Oxford University Press. 1998: 71, 386. ISBN 978-0-19-509539-5. ^ Discovering How Greeks Computed in 100 B.C.. The New York Times. 2008-07-31 [2010-03-27]. ^ Van Helden, A. The Moon. Galileo Project. 1995 [2007-04-12]. ^ Consolmagno, Guy J. Astronomy, Science Fiction and Popular Culture: 1277 to 2001 (And beyond). Leonardo (The MIT Press). 1996, 29 (2): 128. ^ Hall, R. Cargill. Appendix A: LUNAR THEORY BEFORE 1964. NASA History Series. LUNAR IMPACT: A History of Project Ranger. Washington, D.C.: Scientific and Technical Information Office, NATIONAL AERONAUTICS AND SPACE ADMINISTRATION. 1977 [2010-04-13]. ^ Zak, Anatoly. Russia's unmanned missions toward the Moon. 2009 [2010-04-20]. ^ Rocks and Soils from the Moon. NASA. [2010-04-06]. ^ Coren, M. 'Giant leap' opens world of possibility. CNN. 2004-07-26 [2010-03-16]. ^ Record of Lunar Events, 24 July 1969. Apollo 11 30th anniversary. NASA. [2010-04-13]. ^ Martel, Linda M. V. Celebrated Moon Rocks --- Overview and status of the Apollo lunar collection: A unique, but limited, resource of extraterrestrial material. (PDF). Planetary Science and Research Discoveries. 2009-12-21 [2010-04-06]. ^ Launius, Roger D. The Legacy of Project Apollo. NASA History Office. July 1999 [2010-04-13]. ^ SP-287 What Made Apollo a Success? A series of eight articles reprinted by permission from the March 1970 issue of Astronautics & Aeronautics, a publicaion of the American Institute of Aeronautics and Astronautics.. Washington, D.C.: Scientific and Technical Information Office, National Aeronautics and Space Administration. 1971. ^ NASA news release 77-47 page 242 (PDF) (新闻稿). 1977-09-01 [2010-03-16]. ^ Hiten-Hagomoro. NASA. [2010-03-29]. （原始内容存档于2011-06-14）. ^ Clementine information. NASA. 1994 [2010-03-29]. ^ Lunar Prospector: Neutron Spectrometer. NASA. 2001 [2010-03-29]. （原始内容存档于2010-05-27）. ^ SMART-1 factsheet. European Space Agency. 2007-02-26 [2010-03-29]. ^ China's first lunar probe ends mission. Xinhua. 1 March 2009 [2010-03-29]. ^ KAGUYA Mission Profile. JAXA. [2010-04-13]. 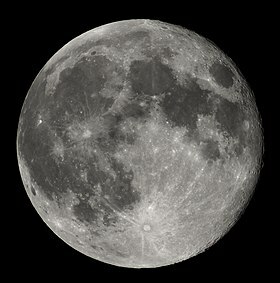 ^ KAGUYA (SELENE) World’s First Image Taking of the Moon by HDTV. Japan Aerospace Exploration Agency (JAXA) and NHK (Japan Broadcasting Corporation). 2007-11-07 [2010-04-13]. ^ Mission Sequence. Indian Space Research Organisation. 2008-11-17 [2010-04-13]. （原始内容存档于2010-07-06）. ^ Indian Space Research Organisation: Future Program. Indian Space Research Organisation. [2010-04-13]. （原始内容存档于2010-11-25）. ^ India and Russia Sign an Agreement on Chandrayaan-2. Indian Space Research Organisation. 2007-11-14 [2010-04-13]. （原始内容存档于2007-12-17）. ^ Lunar CRater Observation and Sensing Satellite (LCROSS): Strategy & Astronomer Observation Campaign. NASA. October 2009 [2010-04-13]. （原始内容存档于2012-03-15）. ^ Covault, C. Russia Plans Ambitious Robotic Lunar Mission. Aviation Week. 2006-06-04 [2007-04-12]. ^ Russia to send mission to Mars this year, Moon in three years. "TV-Novosti". 2009-02-25 [2010-04-13]. （原始内容存档于2010-09-13）. ^ About the Google Lunar X Prize. X-Prize Foundation. 2010 [2010-03-24]. （原始内容存档于2010-02-28）. ^ President Bush Offers New Vision For NASA (新闻稿). NASA. 2004-12-14 [2007-04-12]. ^ NASA Unveils Global Exploration Strategy and Lunar Architecture (新闻稿). NASA. 2006-12-04 [2007-04-12]. ^ Budget Information: FY 2011 Budget Overview (PDF). NASA. [2010-04-13]. ^ India's Space Agency Proposes Manned Spaceflight Program. SPACE.com. 2006-11-10 [2008-10-23]. ^ 160.0 160.1 Can any State claim a part of outer space as its own?. United Nations Office for Outer Space Affairs. [2010-03-28]. （原始内容存档于2010-02-18）. ^ How many States have signed and ratified the five international treaties governing outer space?. United Nations Office for Outer Space Affairs. 2006-01-01 [2010-03-28]. （原始内容存档于2010-02-18）. ^ Do the five international treaties regulate military activities in outer space?. United Nations Office for Outer Space Affairs. [2010-03-28]. （原始内容存档于2010-02-18）. ^ Agreement Governing the Activities of States on the Moon and Other Celestial Bodies. United Nations Office for Outer Space Affairs. [2010-03-28]. ^ The treaties control space-related activities of States. What about non-governmental entities active in outer space, like companies and even individuals?. United Nations Office for Outer Space Affairs. [2010-03-28]. （原始内容存档于2010-02-18）. ^ Statement by the Board of Directors of the IISL On Claims to Property Rights Regarding The Moon and Other Celestial Bodies (2004) (PDF). International Institute of Space Law. 2004 [2010-03-28]. ^ Further Statement by the Board of Directors of the IISL On Claims to Lunar Property Rights (2009) (PDF). International Institute of Space Law. 2009-03-22 [2010-03-28]. ^ Marshack, Alexander (1991): The Roots of Civilization, Colonial Hill, Mount Kisco, NY. ^ Brooks, A.S. and Smith, C.C. (1987): "Ishango revisited: new age determinations and cultural interpretations", The African Archaeological Review, 5 : 65-78. ^ Duncan, David Ewing. The Calendar. Fourth Estate Ltd. 1998: 10–11. ISBN 9781857027211. ^ For etymology, see Barnhart, Robert K. The Barnhart Concise Dictionary of Etymology. Harper Collins. 1995: 487. ISBN 0-06-270084-7. 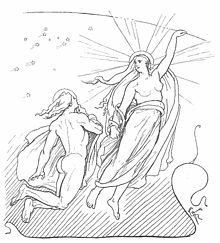 For the lunar calendar of the Germanic peoples, see Birley, A. R. (Trans.). Agricola and Germany. Oxford World's Classics. USA: Oxford. 1999: 108. ISBN 978-0-19-283300-6. ^ Carved and Drawn Prehistoric Maps of the Cosmos. Space Today Online. 2006 [2007-04-12]. ^ 172.0 172.1 Lilienfeld, Scott O.; Arkowitz, Hal. Lunacy and the Full Moon. Scientific American. 2009 [2010-04-13]. Needham, Joseph. Science and Civilization in China. 3, Mathematics and the Sciences of the Heavens and Earth. Taipei: Caves Books. 1986. ISBN 0-521058015. Exploring the Moon. Lunar and Planetary Institute. [2007-04-12]. Moon Articles. Planetary Science Research Discoveries. Jones, E.M. Apollo Lunar Surface Journal. NASA. 2006 [2007-04-12]. Teague, K. The Project Apollo Archive. 2006 [2007-04-12]. Lunar Atlases. Lunar and Planetary Institute. [2007-04-12]. （原始内容存档于2011-12-18）. Gazetteer of Planetary Nomenclature (USGS) List of feature names. 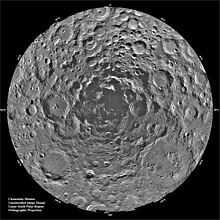 Clementine Lunar Image Browser. U.S. Navy. 2003-10-15 [2007-04-12]. 3d zoomable globes: Google Moon. Google. 2007 [2007-04-12]. , Moon. World Wind Central. NASA. 2007 [2007-04-12]. NASA's SKYCAL—Sky Events Calendar. NASA Eclipse Home Page. [2007-08-27]. Find moonrise, moonset and moonphase for a location. 2008 [2008-02-18]. HMNAO's Moon Watch. 2005 [2009-05-24]. See when the next new crescent moon is visible for any location.